Spoonflower can be a great tool and platform for growing your creative business. 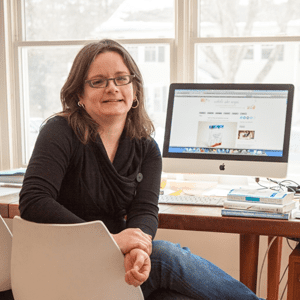 Designer and writer Abby Glassenberg has created a series of three posts exploring how designers can build community, leverage contest wins, and maximize sales in the Spoonflower Marketplace. In this last installment we’ll look at how Spoonflower designers can use the Weekly Design Challenge to strengthen their businesses. ****Beginning in April 2016, our contests will inspire designs and celebrate designers in new and bigger ways! The timeline for contests will shift from one each week, to one each month. We will announce the new contest themes and open them for submissions on the first Monday of every month, and that's when designers can start whipping up an entry for the contest. Each contest will be slightly different and feature different prizes. 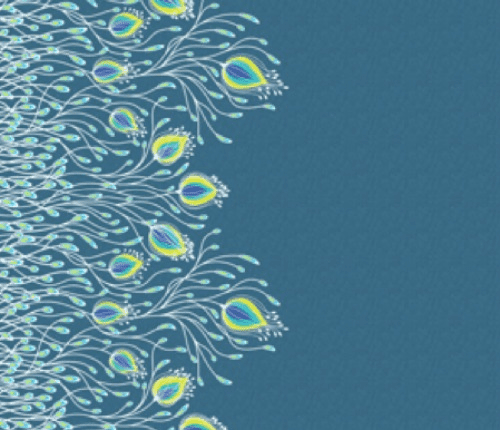 Each week Spoonflower hosts a fabric Design Challenge. Everyone is invited to submit a design based around a specific theme. Sometimes silly, sometimes seasonal, the theme is meant to challenge the Spoonflower community to come up with new designs they might not have arrived upon otherwise. The community votes on their favorite and the winner receives a $100 Spoondollar credit to use on the site. If you’re an aspiring surface pattern designer hoping to grow your portfolio and launch a business with your designs, the Spoonflower Fabric of the Week contests are not only a fun way to stretch your design muscle, they’re also an opportunity to better understand what makes a design sell, to define your audience, and to show companies what you have to offer. 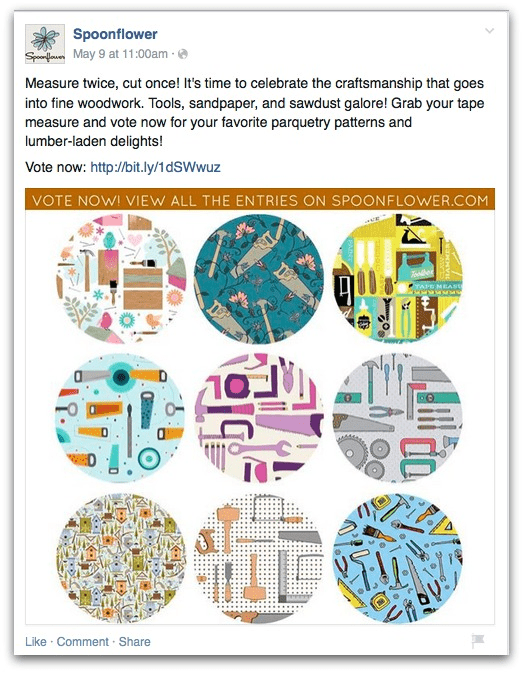 Facebook fans are encouraged to visit the Spoonflower site to vote in the weekly contests. In the busy world of social media, it can take a lot of time and effort to get your work seen by a large number of the right people. Weekly design contest participants benefit from Spoonflower’s website traffic and social media following. Spoonflower posts all of the contest entries on the Spoonflower blog and voting is encouraged through posts on the Spoonflower Facebook page and email newsletter. While voters are perusing the entries they can click on a designer’s name to see their entire design library. As a designer you’ll likely gain new “follows” and “favorites” this way, meaning that people can more easily find and return to your design library to shop. New follows and favorites have another benefit as well. These interactions affect the algorithm the Spoonflower site uses to determine where a designer’s shop appears in searches. “All of these actions [by voters] either singularly or in tandem helps raise the visibility of a designer which means higher rankings,” explain Virginia Odien, a designer who frequently enters the weekly contests. “It's a win for the designer and a win for the voter who by favoriting or following has a way to see that design again later and perhaps purchase.” Designs that are highly favorited are also likely to make it onto Spoonflower’s homepage lists of trending fabrics. 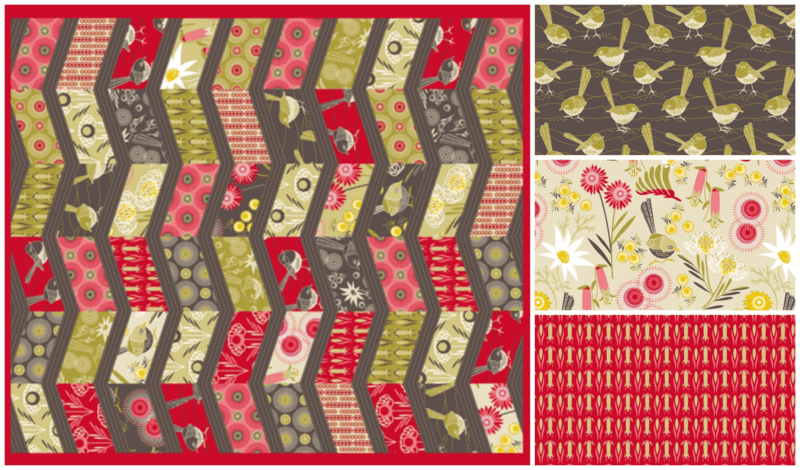 Perhaps best of all, the top ten fabrics in each contest are offered as a fat quarter bundle on the Spoonflower homepage under “Gift Ideas.” Designer Julie Lynch explains that the fat quarter bundles “tend to sell well when it is a limited color pallet theme or a popular topic. By far the best contest theme [for selling fat quarter bundles] is the tea towel calendars, usually in November each year. These are perfect for Christmas gifts.” When a customer goes through checkout on Spoonflower, they’re asked if they’d like to add the design contest fat quarter bundle to their cart, further boosting sales of the top ten designs. Virginia Odien’s peacock border print won second place in a recent contest due in part to her careful thinking about audience. Besides the attention your participation in the contests can bring, preparing a contest design can help you get into the mindset of the consumer, thereby strengthening your portfolio. Odien says, “I like to put myself into the shoes of a fabric buyer. What would I like for quilting, decor or garments?” By considering the audience for her fabric, Odien is able to tailor the design to better meet its end use. “For the recent ‘Flowers for Mom Border Print’ contest I created something I thought would work for a mom on the go. A darker ground…and a vertical line to give length to a body that might be tired from running after kids all day! And lastly I wanted great movement for a skirt or shirt.” At least in part this kind of thoughtful analysis led to Odien’s second place win. Julie Lynch’s cheater quilt design and three of the coordinates she created to go with it. Placing well in the weekly contests can attract the notice of people looking to license surface designs. 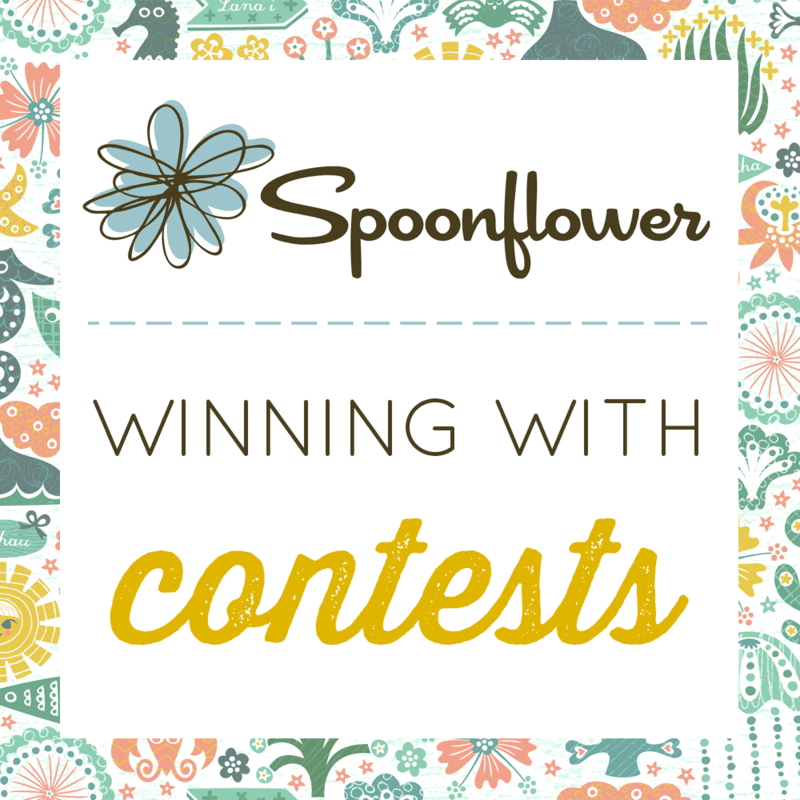 For some contests Spoonflower will partner with companies to create a prize that includes an exciting licensing deal. The winner of the annual Fabric8 contest, for example, gets to design a fabric line with a major manufacturer of quilting cottons. Other recent contest partnerships have included licensing deals with Connecting Threads, Milk and Honey Shoes, and CWDkids. Companies searching for fresh talent in surface design may peruse the top ten contest winners’ design libraries and get in touch directly as well. If a licensing deal is your goal, the Spoonflower Weekly Design Contest may very well help you to meet it. As Lauren puts it, “There is definitely a momentum to winning a contest which spurs on a desire to think about what makes a winning design on the site and how the work is received.” Consider the Spoonflower design contests as a way to get your work in front of a large population of potential customers and use the information you gain as motivation to improve what you’re offering. Overtime this feedback loop will help you to grow your surface design business and reach an even wider audience. I’m Abby Glassenberg, the author of While She Naps. My blog is about sewing stuffed animals and running a creative business. I’m interested in soft toy design, publishing, the sewing industry, and entrepreneurship for creatives. Most of all, I believe that it’s possible to build a creative business that sustains you. A quick clarification: I’ve won the Connecting Threads contest twice but neither of those contests were in any way connected to Spoonflower. Connecting Threads and Spoonflower have never been co-sponsors of a contest. SF was nice enough to work with CT the first time I won their contest by offering a bundle of fabrics to a lucky winner that included fabrics from my first collection at CT and hand-picked designs of mine at SF. Thank you so much Abby and Spoonflower!